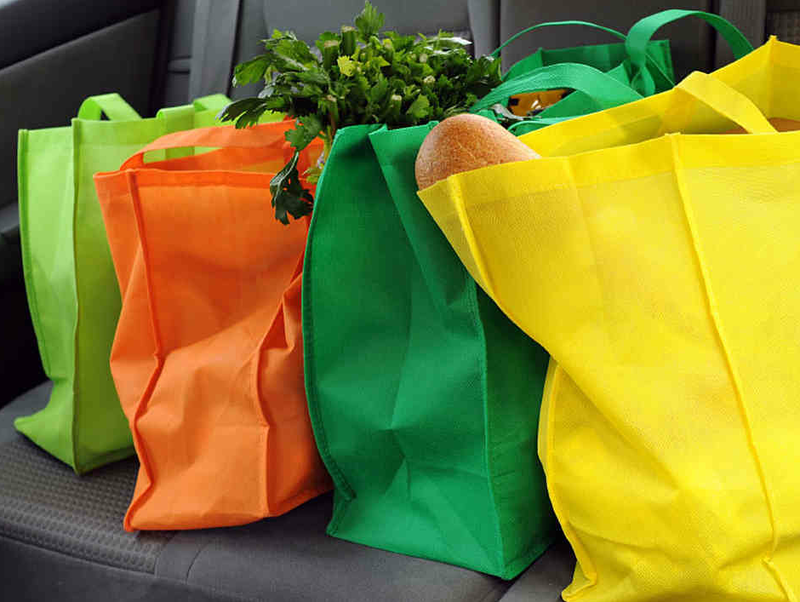 Switching to reusable bags is a great way to conserve natural resources, protect the environment and promote your business, but there is some maintenance tied to reusable shopping bags. With simple steps and easy care you can keep your reusable bags clean and your family healthy. Developing good practices now will help establish habits that will become second nature. Here are some tips for caring for your bags. If your bag features a tag with washing instructions follow those steps. If not, the material of your bag dictates how you care for it. If using a washing machine, play it safe and use cold water if you are unsure what settings to use (cold water is the better choice anyway as it saves energy). Some loosely woven materials, like jute may not hold up in a washing machine, so hand washing may be the best method. If you hand wash your bags simply fill a sink with warm water and a disinfectant soap. One at a time submerge the bags in the water and swoosh the bags around the sink to ensure they are completely saturated all the way through. Scrub any visible stains with a soft brush. Empty the sink of sudsy water and refill with fresh water and go through the process of submerging and swishing the bags in the water to thoroughly rinse and remove all traces of soap. Dryers are tough on fabrics and some materials are just not cut out for dryers. Material that features a loose weave can become damaged in the dryer and some materials made from recycled plastics can melt under high heat conditions. Consult the care instructions if available, but when in doubt air dry your reusable shopping bags. Ideally you should try to clean your reusable grocery bags once a week, but that may not always be possible. Freshen up your bags in between washes and kill any lingering germs or bacteria by putting your bags in the dryer on high heat to kill the germs. You can also make your own eco-friendly germ killing, disinfectant spray. Not only will this keep your bags smelling fresh, but it will also keep them clean. Quickly spray the bags as soon as you’re done unpacking your groceries and make sure they are dry before you put them away or return them to your car for your next shopping trip. You want to just use the reusable bags earmarked for shopping for carrying groceries, and if you have a reusable bag you use to tote items back and forth from the office or to the gym or beach make sure to just use that bag for that specific task. When you use the same bag for multiple purposes you run the risk of cross contaminating. Reusable bags for food should only be used for food, and reusable bags used for other purposes should only be used for those tasks. Cashiers and baggers at grocery stores have been sorting your groceries when they pack bags for years. Take a cue from them. Designate your reusable grocery bags for certain products, so each time you go to the store you use the same bag to carry dairy, or meat, or produce. By using this system if your produce bag is contaminated with bacteria from a head of lettuce the jar of tomato sauce and the gallon of milk you also picked up will be safe. There is always going to be bacteria. Based on growing and handling methods produce may be contaminated and packaged meat is bound to leak from time to time, so your reusable bags will be soiled. If you take care to always use the same bags for the same items you drastically reduce the odds of spreading bacteria to items and packaging that you’ll handle, but you probably won’t wash – like yogurt containers and soda bottles. Label your bags with a permanent marker, so you remember which bags are to be used for which products. If you choose to market your brand with a custom reusable bag think about printing the care instructions on the bag itself, so folks know how to wash and dry the bag. If you don’t want to print the care info directly on the bag, think about creating an insert to include with the bag when you hand them out, informing people on proper care and tips for remembering their bags. This info can also make a great blog post or maybe can be included in a newsletter. Educating your customers keeps everyone healthy and allows you to demonstrate that your company cares. Reusable bags sometimes get a bad rep as being unsanitary – don’t let that discourage you from using reusable bags to carry your groceries or to promote your business. Reusable bags need to be cleaned just like you clean your kitchen counters and dishes and other surfaces that come into contact with food. A week’s worth of reusable bag can keep thousands of disposable bags out of landfills and that benefit makes the minor tasks of washing and drying and labeling worth the effort. Want to Win a Million Bucks? Put on Your Recycling Thinking Caps! Thank you for providing these simple instructions. Hey Dora, thanks for stopping by and taking time to comment. These are pretty simple instructions and we wanted to get the word out that it is easy and important to keep your reusable bags clean and healthy for your family. You are most welcome Dora and thank YOU for stopping by. Pingback: Are Grocery Tote Bags Dangerous to Your Health?